Recently I was interviewed for an article in an absolutely beautiful Christian magazine. It was a pleasure to speak to the interviewer and I hoped that my message would be a blessing to anyone who read the article. Unfortunately, I was not blessed by reading the article. I was distraught. I was so surprised by the things I was quoted as saying. I can’t imagine saying them. In fact, I’m pretty sure I didn’t. If I did, I need to apologize to every reader. I really truly hope I didn’t. There were several quotes that frustrated me but one that simply pushed me over the edge. WHAT????? I can’t believe those words would have come out of my mouth! 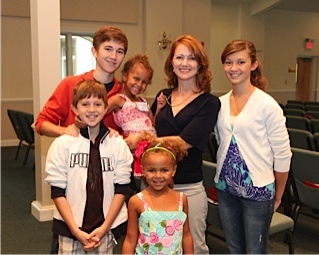 Lots of kids…well…yeah, but they are a BLESSING!!!!! And life got in the way of our marriage? Our life was part of our marriage…the choices we made together to raise children, adopt children, homeschool children, work a high-pressured job, and be involved in our church and community were things that together we decided would enrich our marriage, our family, and our life. I NEVER EVER EVER want my children to think that they in ANY WAY had ANY PART in the divorce of their parents. THEY DID NOT!!!! My husband leaving was solely his deal. His issue…not mine and most definitely NOT THEIRS! I’m not sure if you can tell that I’m quite passionate about this…quite annoyed too. This is exactly the message I hear so often – “Well, your life was really full…” as if full is a bad thing!?! God has a wonderful way of describing a house full of children – a heritage, a reward, arrows, a blessing…what’s not to like about that! YES! Our life was full…it was full of…LIFE! Meals shared, prayers uttered, stories read, games played, hugs and kisses given, bedtime snuggles, wrestling matches, workdays, school book studying, chores nagging, yard work doing, church services worshipping, Bible study learning, small group getting-together, pool splashing, bike riding, football throwing, soccer ball booting, basketball shooting, scraped knees and broken bone comforting, vacation loving, family visiting, being and growing and doing this whole living thing together! It was not perfect, but it was beautiful. It was crazy. It was fun. It was frustrating. It was difficult. It was loving. It was a blessing. It was our life. And it was worth fighting for. I guess I just want to say that I don’t believe that I was perfect nor do I believe that our life was perfect, but I do believe that it was just right for us. I believe that our children were and still are blessings…wonderful, silly, sometimes stinky blessings. I believe that the challenges are worth it. I believe that the day to day living of life as a family is exquisite. I know I cannot go back and fix my family or that article…but I can tell you that it has given me a new resolve to enjoy my family…all the exhaustion, all the chaos, all the challenges… it has reminded me that this life is a blessing that I don’t want to miss. Lately I’ve uttered words to God like, “I don’t want to do this anymore,” and “I can’t do this anymore.” But God is reminding me that I do really want to do this life…that I love this life. And He is showing me that I can do this because I have Him…and it is worth the fight. I might have lost the fight for my marriage, but I did not lose the fight for my family. I have them right here with me and I’m proud to say that I have a full quiver of arrows! I will be the mighty warrior in this family and protect and fight for it! Previous Article Are You Stuck in a Miry Bog Too? Kathy, thank you so much for the reminder! You are right it does go faster than we think possible! God bless you! Thank you so much! I wish I could write them more often…plenty of material LOL!!! Amazing post again. You are a psalmist midst these contemporary days of deep and dark despair, a blazing light pointing to the only true hope, The Lord Jesus Christ! Oh my goodness! Thank you so much! I don’t think I deserve the praise but I appreciate it! To HIM be the glory! Your family is absolutely beautiful. You are an inspiration to me and I love all of your messages.and posts. I am in the middle of your book right now and I can relate to every single thing in it. Thank you and God Bless. What a pity that the interviewer didn’t hear your heart 😦 Context is everything. Anyone who reads that article – and hopefully there is a link to your blog – will have the opportunity to hear your true heart. Let’s hope that many find you here. Your kiddo’s are lucky to have you! Thank you! I’m lucky to have them too! Yes indeed ALL the glory to the Lord He inhabits the praises of His people! We are to encourage an affirm each other along the journey. That is my motivation here. In His care and undying love. Heard you on Focus and got your book and it has been so good for me. Many of the things you said on Focus were like my life in audio. You have been such a blessing to me as I fight for my marriage of 28 years with very similar circumstances. My husband has left me 2 times but I continue to trust The Lord and honor the covenant I made. It was so good to have another woman express the same feelings that I have towards marriage. Thank you for sharing your life and helping me with mine!! May God continue to bless you abundantly. I’m so very sorry you are walking a similar path – I will pray for you to be strengthened and encouraged! God is faithful and He will provide! Thank u Susan for the beautiful reminder that it is such blessing to have children! Mat God continue to pour out his love over the children and you! Thank u for taking time to pour ur heart and truth out in ur blogs, I get so excited to read them, u have been such an encouragement to me as I am traveling a journey similar to yours.Thank u Susan! Thank you for your kind comment. I’m so glad you enjoy my blogs – that’s such an encouragement. What a beautiful family you have, Sue! I too was first introduced by Focus and am reading through your book. I hope readers of the article will search for more because that casual attitude towards marriage and family is NOT reflected here. Instead, there is honesty, brokenness, hope, and even joy in the midst of difficulties brought by the choices of another. Keep sharing your life and light as God gives you the strength and desire to do so! Never doubt the inspiration or loving mom that you are! No one who knows you or knows what you have been thru has ever doubted either! Thank you Debbie! You are a blessing to me! I listened to your broadcasts on FOF. It was as if you were telling my exact story of “surprise” divorce after a 16 year marriage. Your ministry of helping the too-many-of-us who have experienced this nightmare IS ashes to gold! Wow! Loved your statement of how the cause of divorce was all about him, there was nothing I could have done differently. That he gave up on God before he gave up on me and he has to live with that between he and God(paraphrase), was a liberating statement for me. Thanks and blessings to you! I thank God for your ministry! I’m so glad God blessed you through my story! That blesses me too! I’m praying for God to comfort you as you walk this difficult path. IMHO, the finest gold about your story Sue is how you looked past the emotion and recognized that reconciliation was top priority. You made the choice to look outside yourself first, then once you realized it wasn’t received you had no choice except to pursue divorce. The offended can quickly “give up” on God also and miss the glory of a miraculous recovery out of the ashes. Awesome verse!!! Thank you for sharing! Sue, I think life intrudes on all of us at times but that doesnt mean we dont love it. I really worry about you. Your posts are continually about struggling and how hard things are and I’ve been reading your posts for years now and it doesnt look like you are moving forward. You have forgiven your ex but clearly resent him horribly and I pray God can help you get past it. its not healthy for you or your children. I am not trying to find fault, and you probably werent a bad wife, but , have you ever thought about why your ex choose to look outside your marriage? He was a jerk and wrong to have a problem and not try to resolve it with you but surely there had to be some problem or he would not have looked outside the marriage. Generally both parties contribute to the death of a marriage and one of the best things that happened to me was when God touched my heart about this and I gave up my “victim” role and understood that there were things I could have and should have done differently in my marriage. It changed my life and I am far healthier and happier. yes, I had to be willing to acknowledge that he wasnt 100% wrong and I wasnt 100% right but my whole family is better off. We have a much better relationship since I told him I was sorry for my part and asked his forgiveness. I know my children appreciate the difference because my 14 yo daughter told me that she didnt know what changed but she was glad it had because s much of the tension was gone. We’ve even gone out to dinner with the ex andit was good for the kids to see that. Thank you for sharing your thoughts with me…please do not be concerned about me! I’m doing just fine. Each of my blogs is a snapshot of a moment in a day…even a moment when I’m less than stellar…a moment I want to share because of where God brought me in the next moment. I want to comfort with the comfort I’ve received from God…He loves me so very much. With regard to seeking forgiveness from my ex-husband…I’ll have to pray about that one. I have shared the process I went through of self-analysis in my book. I believe God brought me to the exact point He wanted me in order for me to heal and grow and move forward. The story I share is my own…not my ex-husband’s…I do not want to vindicate myself by sharing his, but I will say that I do not believe that divorce takes two people…it takes two people to make a marriage, but it only takes one to make a divorce. We each have different stories…different circumstances…different pasts, presents and futures…thankfully we each get to see God work in our lives in just the right way! I’m so thankful that God worked in yours in such a profound and freeing way. I believe that He has done the same for me! My ex and I have a relatively good relationship but that does not negate the after-effects of his decision…they will reverberate for generations…that is sometimes a bit overwhelming for me, but it also doesn’t change the fact that I trust God, I have forgiven my ex and I hold out great hope for each day ahead. Thank you again for taking the time to write your thoughts…and for reading my blog! I have been blessed to see how God has grown it in just a year’s time! This response is one that troubles me. God hates divorce and only allows it in 2 instances according to scripture. I don’t believe there is ever an instance when this is the best option but sometimes I know it can’t be helped. To say that something in the marriage made the man or woman look outside for met needs is totally against what God expects of us as Christians. Many couples recover from adultery and I do believe (again from scripture) that this is what God calls us to if we can but He does know the deep hurt that this sin causes. That is a lot of guilt to put on the spouse who has been cheated on. Your spouse is supposed to be the one person on this Earth that you can count on no matter what. There are many great examples of this,James and Shirley Dobson, James and Kathy MacDonald, Billy and Ruth Graham and many more who will tell you that there spouse has many faults as we all do. As Christians we are called to love without ceasing. I know in my instance that God freed me from any guilt about what I could have done to prevent my husbands adultery. It was totally about him and I believe his relationship with God. Did I have things I could have done better, yes sure I did but these 2 things are totally 2 different issues. I can only imagine the stress of raising 5 children as my 3 kids were older during our crisis and I barely made it through some days. My youngest still has issues from this time and I can’t say that it doesn’t make me angry but that doesn’t mean I am not moving forward but I think that is the human side of us. Sue your family is precious and I just wanted to say that I do understand your frustration with the demands of a large family with your husband no longer there to lean on. I pray everyday that God will draw me closer to Him do that I can be a better wife and mother but I’m sure I’ll fail. It is only through loving Him that we can truly love others as we should. I admire your confidence that you did absolutely nothing wrong in your marriage. I was a good wife, but I know that I spent too much time being a mommy and I forgot that I was a wife too and that relationship needed care and nourishing also. I later read that spending quality time with your spouse is critical to a marriage. To me, my children were the focus of most of my time and time with my spouse always involved children and children’s activities. Rather than telling me that he felt neglected or not important, my ex found someone who would give him attention. I know going forward that should I ever remarry, I need to be both a mommy and a wife nurture both relationships..being a mom and also being a wife. Since hearing you on FOF, and reading your book and following your blog…your heart for your children has been made known to us, and also, your heart towards the Lord! Raising children alone is so hard….and at the same time, they are such a blessing! I am praying for you and your kids….knowing that God is faithful in all things!!! Thank you so much for your prayers! And your encouraging words! Reading your words is wonderful, as if I am listening to you as we used to, sipping tea, while the whirling dervish of your life with five kids twirled round us and you didn’t seem to notice. (Your home was ALWAYS being opened for church care groups, bible studies, etc.) You always focused on the person near you. That amazed me and although I haven’t seen you recently, I imagine you continue to treat guests royally. And your focus was and seems still, to be on God, the One holding all of us together. And you trust Him to continue to be your strength. I hear it in your voice of words in black and white. It’s great to hear your truthful heart, growing in the grace and knowledge of Christ. Miss ya sis (my fault)!